I found a snake! Is it venomous? One of the most common snakes found, Texas Rat Snake, is non-venomous. The Texas Rat Snake is a large imposing, but harmless snake, that will climb trees, buildings, etc. They can be 4 to 6 feet long. They eat mice, rats, bird eggs, and birds. When cornered or frightened, the rat snake will vibrate the tip of its tail rapidly mimicking a rattlesnake, however there are no rattles on the tip. 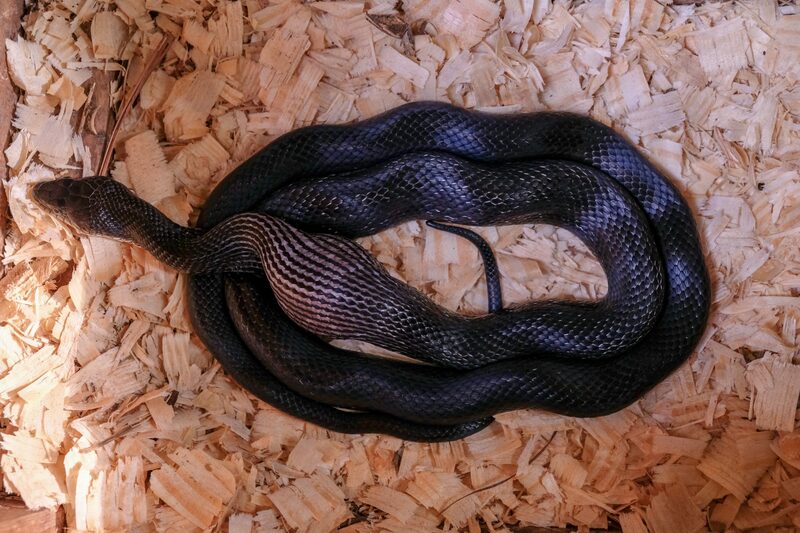 This is a Rat Snake. The tail is slender and has no rattlers, however the rat snake will vibrate their tail to mimic a rattlesnake when they feel threatened. The head will be slightly smaller than their body. Or, a video of the rat snake. Notice tip of tail has rattlers, this is a rattlesnake. A venomous snakes’ head will be shaped like an arrowhead. Texas venomous snakes are Rattlesnake, Copperhead, Cottonmouths, and Coral Snakes. Proceed to this link for further guidance on identifying the snake. All snakes are beneficial to our environments. Provided the non-venomous snake is not in your home or building it should be left alone. The snake will most likely retreat when discovered. If outside and you can’t wait for the snake to retreat, gently encourage the snake to move on by squirting lightly with a water hose or herd with a broom. Normally, you will not see the snake again. If you do, it is because there is a food source most likely mice or rats. Read FAQ: How to discourage snakes in your yard. I found a snake in my house! Remain calm! Do not agitate or cause the snake to go into hiding. First, what kind of snake is in your home? Use this link to determine what species of snake. If you know the snake is nonvenomous take a push broom and gently herd it out the door. If you are not sure if the snake is venomous or not, try one of the following suggestions for containment. Gently place a pail or trash can over the snake and put a weight on it. Close off the room and place a barrier so that the snake cannot crawl under the door. Consider creating a barrier with boxes or boards to contain the snake. Once the snake is contained, contact your local animal services or a professional pest control operator. In some cities the police or fire department may respond to a snake in a home. Remember snakes are beneficial to our environment. Venomous snakes need to be removed by a professional for the safety of our families and pets. Non-venomous snakes should be allowed to go on their way. As with all unwanted wild animal encounters, you must be proactive in discouraging visits. Read FAQ: How I can discourage snakes in my yard? For all those intriguing questions you have about snakes and didn’t know where to look, “Texas Parks and Wildlife-Snake FAQ”. How to discourage snakes in your yard? To discourage snakes in your yard remove shelter and food sources. Shelter could be a wood/brush pile, stack of building materials (keep materials 18 inches or greater above ground), over grown plants/weeds/grasses, access under or through cracks in a deck or out building, and/or compost/mulch. Modifications to prevent access of these potential shelters will discourage snakes. Inspect your home from the ground level around your foundation and any plumbing. Be sure all plumbing openings have been secured in your laundry room, bathroom and kitchen. Any gaps must be filled to prevent a possible entry. Remove all food sources for rodents and insects, such as bird feeders, uncontained garbage, pet food left out, or food items stored in a garage or out building, and/or waste in a compost pile. Embrace the benefits of your mammal wild neighbors such as the opossum and skunk. Both are immune to the venom of venomous snakes and actively hunt and eat snakes. Remember keeping a balance of predator and prey keeps our environments balanced.